Once. Twice. Three times a baby. 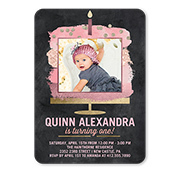 Celebrate her birthday with these baby girl birthday invitations. Growing up, one year at a time. Make his birthday with these baby boy birthday invitations. Make it a blast with charming birthday invitations for kids. 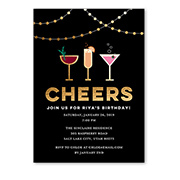 Get the party started with personalized invites for the big bash. Special occasions call for special invitations. Whether it’s your baby’s 1st birthday, your best friend’s 40th or your partner’s day to blow out the candles, custom invitations will show the world how much you value the people in your life on their special days. There is no greater feeling for the person of honor to know you went above and beyond to make their day memorable. 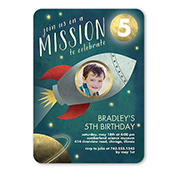 Personalized invitations from Shutterfly are the perfect way to let everyone know a party’s on the horizon. Hosting a party? 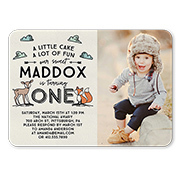 Let Shutterfly help you personalize this great occasion. Whether you are planning an elegant soiree, a teenager’s cool gathering or a kid’s pool party, start the birthday celebration off with an invitation that is sure to say it all. Each of our invitation templates is complete with style, pizazz, and flair, which you can tailor to your liking down to each and every detail. Want something simple and to the point? We have that! Want something loud and fun? We have that, too! Your customized invitation will strike everyone with its excellence, but only you will know how easy it was to create. Simply upload one or several of your favorite photos, find the perfect invitation template for the occasion and personalize to suit your personality and style. Whether this is your first visit to Shutterfly or you are a seasoned pro, we make it easy to achieve what you have in mind. Once you fall in love with the ease, convenience, and quality of designing personalized stationery, you can return to customize thank you cards featuring the greatest photo you snapped at the party. Your guests will feel appreciated and know their attendance was truly cherished when they receive custom thank you cards in the mail. Not looking to throw a party but still want to recognize a special someone’s exciting day? Give your loved one a reason to celebrate when they receive a personalized birthday greeting card. A photo of all the grandchildren on a birthday card for Grandma or Grandpa would be sure to delight. Add one or several custom photos to a template, write a thoughtful note and this card will prove that beautiful photos and graceful words go a long way. Want to write the perfect birthday message but feel stuck? We have some ideas to help write a birthday card to help express your deepest birthday wishes to those you love. Want to add a personal touch beyond the birthday invitations, birthday greeting cards and thank you cards? Dress up the gifts and envelopes, too. Create lovely birthday stickers to affix to your loved ones’ presents for some extra fun and flair. Design personalized address labels to really establish the importance of your special someone’s birthday party by giving the envelopes that professional, “official” feel. As an added bonus, you can use them all year long for other mailings and occasions.